Most people reach for their blenders when they want to make a smoothie, but you don't have to! As long as you choose soft, ripe fruit, you can mash it by hand and stir in your favorite smoothie ingredients, such as yogurt or peanut butter. Get the classic smoothie texture by shaking the mixture with ice until the smoothie is cold and foamy. Use this simple method for your favorite smoothie recipes or create your own custom beverage! Try soft vegetables or vegetable puree. Although most vegetables will be too fibrous to use in a smoothie without a blender, you can use an avocado that's ripe and soft. Remember that you can also include a few spoonfuls of vegetable puree, such as pumpkin, butternut squash, or carrot. 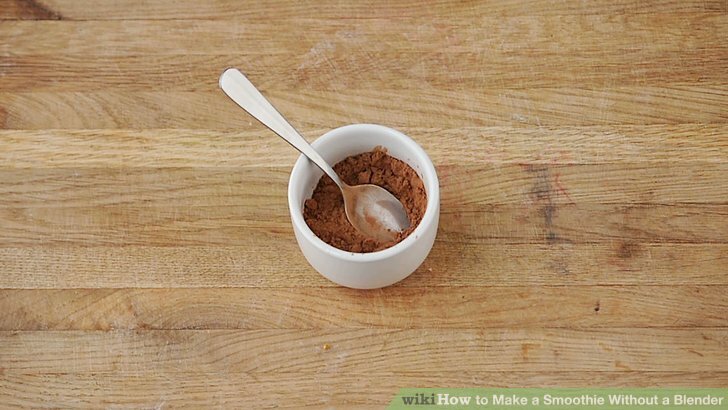 Pureed vegetables will also help thicken your smoothie and give it a bright color. Include proteins that will thicken the smoothie. Soft fruits usually make up most of blender-less smoothies, but you'll need filling ingredients to add protein and give the smoothie a creamy texture. Use your favorite type of yogurt, peanut butter, or chia seeds to add protein. Instead of peanut butter, you can use tahini or sunflower butter, which will give your smoothie protein with less sugar. Choose a liquid to thin the smoothie. You probably won't need very much liquid in your smoothie, but it's good to have nutritious liquids on hand just in case. For a creamy smoothie, get out milk or your favorite alternative milk, such as almond or soy milk. To make your smoothie sweeter, use fruit juice. For example, use apple, grape, orange, or pineapple juice. Mash soft fruits and vegetables. 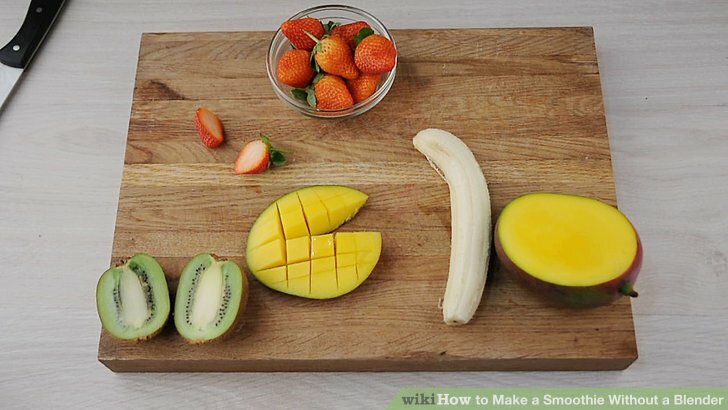 Rinse and remove peels from the ripe fruit. Then place as much fruit as you want into a bowl and use the back of a spoon, a fork, or a potato masher to smash the produce until it's as smooth as possible. Keep in mind that there will probably be a few small lumps in the pureed fruits and vegetables. Stir the mashed produce with your choice of smoothie ingredients. Spoon the mashed fruits or vegetables into a bowl and add any thickeners or powders that you want. Then stir until the powders are dissolved and all of the ingredients are combined. For example, to make a classic strawberry banana smoothie, put mashed strawberries and bananas into a bowl along with a few spoonfuls of yogurt. Stir to combine the smoothie. Shake the smoothie with ice if you want a foamy drink. While you can drink the smoothie as soon as it's combined, you may want it to be colder. Put a few ice cubes into a large jar and pour the smoothie into it. 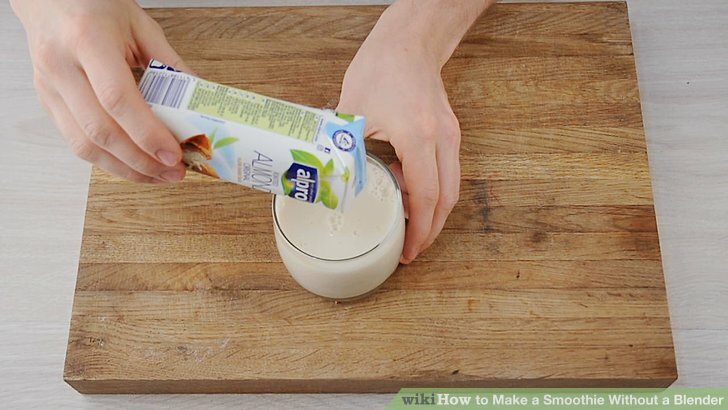 Seal the jar and shake it until the smoothie is cold and foamy. This should take about 30 seconds. To make a frosty smoothie, stir crushed ice into the smoothie just before serving. Keep in mind that the smoothie will have a slushy texture. Add your chosen liquid to adjust the thickness of your smoothie. Once you've combined the main smoothie ingredients, taste it and decide if it's as thick or thin as you want. To thin the smoothie, stir in of juice or milk until the smoothie is the consistency you like. If the smoothie isn't thick enough for your liking, stir in more yogurt or chia seeds. Chia seeds take a few minutes to thicken, so let the smoothie rest before drinking it. Enjoy the cold smoothie. Pour the smoothie into a serving glass and drink it immediately. Because the ingredients weren't blended together by machine, they'll probably begin to separate faster. If this happens, just stir the smoothie with a long spoon and drink it through a straw. Refrigerate any leftover smoothie in an airtight container for up to 2 or 3 days. You'll need to stir or shake it again before drinking. If you have a food processor, you can blend harder fruits and vegetables to stir or shake into your smoothie. For example, blend spinach, celery, oranges, or cherries.